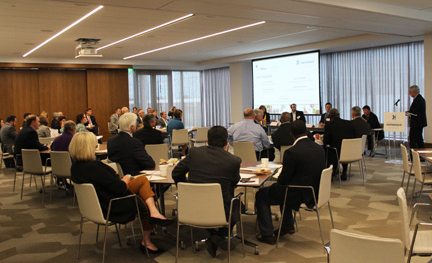 The Greater Houston Partnership (GHP) hosted a town hall on Friday for leaders in the education and construction industries to learn about and discuss ways in which they can partner to bring workforce opportunities to students and build the construction craft workforce of the future. The UpSkill Houston Town Hall: Build Your Facilities and Build Your Community was held in the GHP’s beautiful new space in Partnership Tower, where regional superintendents, college and university chancellors, and construction contractor executives and owners enjoyed a light lunch while listening to the program before offering their own comments and questions to the panel at the end. Bob then went on to address the educators in the room: “What better sector than the education sector to embrace the idea that owners can work with the construction sector and the construction crafts to not simply complete projects on time and on budget, but to also use every project to help build this trained construction craft workforce here in Houston. It takes a conscious effort by the owners to do that.… I am excited by the potential, and hopefully you see the potential as well.” He said that the GHP thinks the education sector has a specific role or even duty to think about how to use its own construction work to accomplish a broader mission than just to erect the needed structures. The program continued with some introductory comments by Stephen Harris. Stephen serves as the Director of the Strategic Design and Initiatives in the Office of Facilities Planning and Construction of The University of Texas System where his work there over the past 15 years included Project Management. He is an architect by training and worked for several architectural firms before joining the University of Texas (UT) System. He has a B.A. in architecture from UT and a master’s degree in Public Affairs from the Lyndon B. Johnson School of Public Affairs. The Office of Facilities Planning and Construction (OFPC) manages 30 to 60 projects at a time, representing $2-3 Billion in contracts at a time to build the facilities required by the UT System. Stephen explained that they do their work in collaboration with the office of Risk Management. He outlined the recent history of the work the office has covered, including the establishment of the Builders Risk Program following the “inconsistent response from the market on builders risk insurance” in Galveston following Hurricane Ike. Stephen did not move on. I will tell you more of his story in an upcoming blog detailing more of his remarks. Hopeton Hay, Director of The University of Texas System HUB Group and the UT Federal Small Business Program, was also prepared to speak, but due to time constraints, Peter Beard, Senior Vice President Regional Workforce Development at the Greater Houston Partnership and panel moderator for the day, moved ahead in the program. Peter then asked everyone in the room to share our names, company names, and our roles there so that the panel would know “who’s in the room.” A wide variety of organizations was represented by the attendees. There were representatives from service and workforce centers, general contractors, specialty subcontractors, universities and community colleges, C3 board members, trade associations, and K-12 independent school districts. The luncheon ended with a palpable buzz of excitement for the innovative new partnerships between construction businesses and education organizations for craft training and for the future of workforce development in the industry.